February is American Heart Month! In honor of this, I thought I’d talk about how to make your office a little healthier. It’s worth noting that I have a degree in dietetics so my zeal for healthy office habits is above average; but, I think it’s a great idea for everyone to work towards a healthier office culture. At Viget, we want our staff to be happy and healthy, and we’ve taken steps to make sure our offices support that. A lot of companies today provide gym membership or reimbursement towards an exercise program as a perk. But, all too often, folks sign up for an exercise program and don’t make the effort to go to the gym. They intend to go, so they don’t cancel the membership; but, in reality, they’re not using it. At Viget, we built and introduced Viget Spots You, our way of reimbursing gym costs, but only for people who actually go to the gym. It integrates with Swarm and, as long as you check in eight times throughout the month, you get $50. This is an awesome way to keep staff motivated to use their gym memberships. We also open Viget Spots You up to alternative types of exercise like rock climbing and yoga for those who want to buck traditional gyms. Through a grassroots effort (AKA enthusiastic employees bringing in their spare gym equipment), we have acquired a small collection of workout equipment for people to use at the office. It sits out in our main working area at HQ and encourages people to take breaks for exercise throughout the day. It’s not unusual for me to walk over to the printers and find someone doing push-ups in the middle of the hallway. We also have a culture of taking group walk breaks. If someone feels like they need a break, they’ll post on Slack and get a group to go on a quick walk. Two out of our three offices have stairs that everyone has to take throughout the day. In Durham, everyone starts the day climbing the stairs to our second floor office. 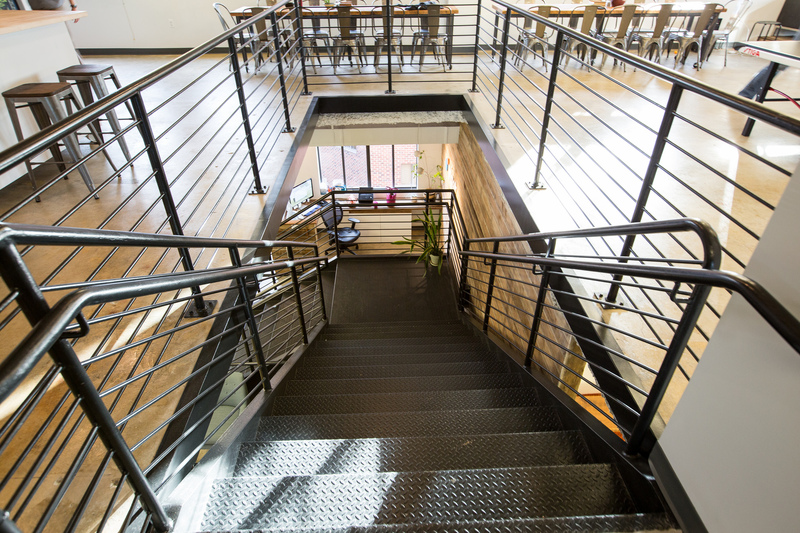 At headquarters, we have a two-floor office with a center staircase. This has been life changing! We’re constantly up and down the stairs throughout the day because our desks sit on the fourth floor while the kitchen and meeting rooms are on the 5th floor. Integrating this small amount of activity is an awesome way to break up the time spent sitting at desks. Did you know that eating alone can have both negative physical and psychological effects? At Viget we make an effort to take a break and enjoy eating with our colleagues. 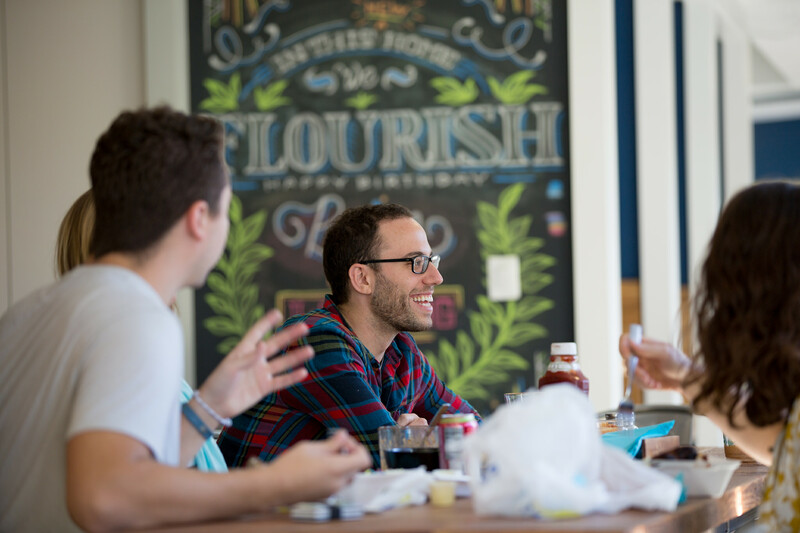 At our headquarters during lunch time, you can find a big group of us gathered around our eating tables chatting and enjoying lunch. Group lunch is a time for us to de-stress and re-focus. When you eat with others, you naturally eat more slowly and enjoy the eating experience more so you come away feeling more satisfied. On average, eating out can increase your calorie consumption by about 200 calories per meal. It also ups your intake of sugar and saturated fats -- things that in excess over time can lead to diabetes and heart disease. Bringing your lunch to work is a better alternative. This past holiday season we encouraged our staff to do just that by providing everyone with lunch boxes and reusable containers (double points for being both healthy and environmentally friendly?). We also stock our kitchen with tools to make your lunch at work -- from cutting boards and knives to a spice cabinet and multiple microwaves, we have lunch covered! It’s probably best to do as the French do and refrain from snacking between meals; but, we all have days where we just need a snack. In the last few years we’ve made the shift to more healthy snack options like fresh fruit, cheese sticks, and nuts. We do stock soda; but, I’m happy to report that our soda consumption is steadily waning as more and more folks switch to seltzer and just plain ol’ water. 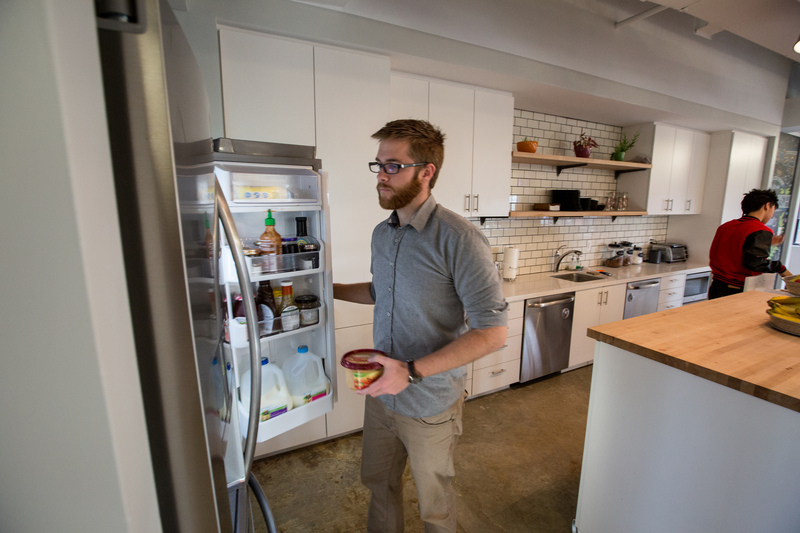 Creating a healthy environment at the office doesn’t have to be hard or expensive. Most of our initiatives have evolved naturally (like group meals and Vigegym) and some are fairly low cost (like providing fresh fruit). The key is to pick a few to try and see what sticks. Ultimately, people tend to want to be healthier and they’ll jump at the opportunity to make their days a little different and a little more health-centered.